Allow me to ELEVENate your Christmas spirit! Man, Christmas Eve sure is close now, isn't it? The gifts have been wrapped, treats have been made and all sort of festive merriment has commenced. Tomorrow is the day but what of today? Today you should start slowing down. Odds are a lot of you have been running for weeks now, trying to get everything done. But if it isn't done by now, it won't make Christmas Eve. So sit back and relax. Accept that not everything can be perfect and that the important thing is to enjoy the holidays. Have a cup of hot cocoa in front of the fireplace and let all that stress wash out of you, so that you'll be ready for a magic and merry Christmas tomorrow. And be thankful that your fireplace only contains a regular yulelog. Huge Christmas cheers for Zarla from frungylovers for creating these adorable pieces of art. Re: Allow me to ELEVENate your Christmas spirit! It's getting harder and harder to make these puns isn't it. I don't know what you are talking about, the puns are as clever and witty as ever. Philistine. Your doing your best Luki... Your doing your best. Nows the time to see if they taste good fried in butter! Fear Boop. Run away and hide. Quickly! That Mycon looks like he's just hanging out. The temperature is probably just about right. It's because they're so boring. I doubt the Chmmr celebrate Christmas. And on that innocuous note, merry christmas everyone. Its already 2pm on the 24th here and I have a hectic next week or so. See you in the new year! Hah! I think you're right. 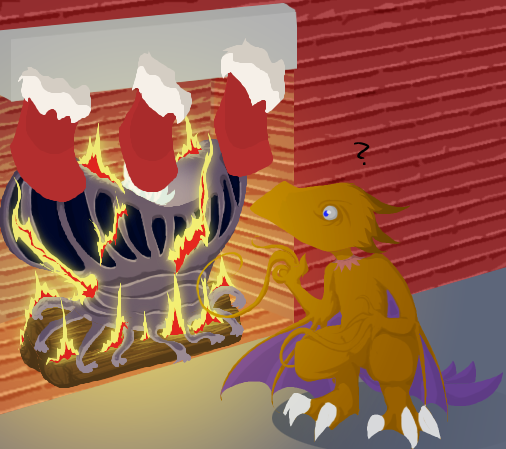 THAT'S why he's in the fireplace; it's the only comfortable spot in the room! The Chmmr are obviously Jewish. I thought everyone knew that already. will eventually produce a new hybrid race"
My god- I think you're right! Aand the Chmmr didn't make the cut . Too bad . Nobody ever gives them any attention. It's not easy, y'know, being a plot device. Those poor Chmmr mean so much yet, so little. I just like it when they get cranky on SC3!